Today it is one of the most common family dogs as it is easy to handle, very tolerant and does not require very much of the owners, other than regular exercise, food and veterinary check-ups. It is often affectionately known as a Golden, or Goldie. What makes the Golden unique is its pleasing personality. This breed gets along well with people and other dogs, however after the seclusion from dog life it may develop human qualities and then may not be fond of other dogs. It will bark when startled but other than that it makes a poor watchdog due to its friendly nature. It is also easily trained because of the natural drive to please the master. This is a dog who wants only to be with people and is happy in the presence of people without being annoying or demanding. The Golden Retriever reaches its full height at about one year of age, and its full weight at about two. While it matures physically at about two years' age, mentally it does not fully mature until three or older, and many owners comment that their dogs retain their puppyish nature for life. 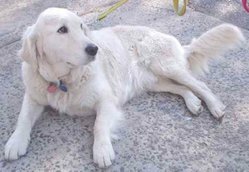 This is a large breed which in appearance is similar in size, general shape, and color to the yellow Labrador Retriever, especially when young and especially those Goldens with lighter coats. The most obvious difference is the Golden Retriever's luxuriant coat. To confuse the two breeds is a serious faux pas to a fancier of either, of course. 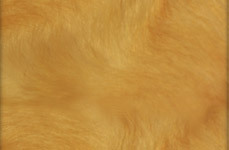 The AKC standard states that the coat is a "rich, lustrous golden of various shades", disallowing coats that are extremely light or extremely dark. This leaves the outer ranges of coat color up to a judge's discretion when competing in dog shows. Goldies are active and fun-loving but also exceptionally patient, as befits a dog bred to sit quietly for hours in a hunting blind. Other characteristics related to their hunting heritage is a size suited for scrambling in and out of boats and an inordinate love for cool water. Like the Labrador Retriever, they are noted for their intelligence, their affection for people, and their tolerance of children. They are natural clowns, which characterizes them as great dogs to use in hospitals or retirement homes. Golden Retrievers make great pets for young children due to their nurturing instincts and gentle nature. The other side of this is that they require lots of companionship to be happy. They do well in obedience trials and make excellent guide dogs, however, like people, not all of these dogs are this way. While they might not do quite as well in field trials as Labrador Retrievers, they are excellent hunters that are famous for their outstanding scenting abilities. They are exceptionally eager to please their owners. Prices current as of last update, 04/23/19 9:35am.